Moving some or all of your medical application to the web promises a wide range of benefits, but a few outdated notions could halt your progress before it ever starts. It may be simple to begin developing for the web, but it takes experience to write the world class code powering today’s Internet connected medical devices and patient data management websites. I’ve been lucky enough to work with these technologies for the bulk of my career, and I’m here to bust three myths that may be holding back. As a developer who focuses on creating positive user experiences, I cannot stand it when I come across a poorly designed interfaced that forces me through unnecessary loading screens or unintuitive workflows. With all of the tools and resources we have available today, every web application can and should behave as quickly and elegantly as any other native software application. Modern HTML5 web browsers offer everything we need to develop applications that respond instantly to user input and transition smoothly between desktop and mobile displays. Unlike traditional websites that load each page individually, custom medical web apps can bundle and compress the entire user experience into a single small download which can usually be cached for even faster loading in the future. 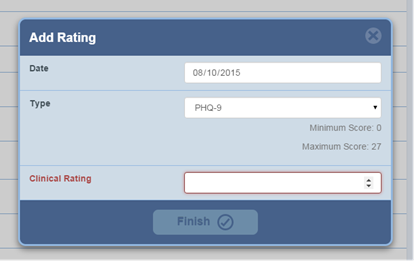 Here’s an example of a form that’s validated in real time. Note that the Min/Max scores are updated automatically when the Type selection is changed, thereby guiding the user to enter a valid Clinical Rating. The Finish button remains disabled until all of the required fields are filled out. A great user experience is about more than just responsiveness though; it’s about limiting all of the little annoyances that slow down or impede a user working through what is an otherwise solid presentation. Did you ever have a dialog message interrupt what you were working on? Or one of my favorites: have you ever submitted a form only to get a message that something was wrong and they made you redo the entire form? Some may view these examples as trivial, but a professional medical application development firm takes these user experience issues quite seriously. I like to target these issues like any other quality metric that needs to be considered throughout an application’s development. Simple improvements can start with a more informative title or adding an easily distinguishable icon. More comprehensive goals such as keeping layouts and terminology consistent are paramount to the user accomplishing their tasks quickly and how well your application is perceived. The free, if somewhat archaic, tools that most early web developers started with may have left a bad impression. Several years ago, while I was involved in planning a new business application, the discussion turned to the possibility of leveraging web technologies to increase our productivity. The department head’s initial response was “No, we’re not writing code in Notepad”. The free, if somewhat archaic, tools that most early web developers started with may have left a bad impression. However, the open nature of web development has led to the creation of modern world class tools. Development tools that come with modern browsers such as Chrome, Firefox and Internet Explorer often surpass the capabilities of those used for traditional application development. With today’s web development tools I can debug, edit, and preview changes to an application’s code and user interface in real time. I don’t lose time compiling code or waiting for new builds. With sound planning, I can take mockups that have been battle tested through customer and management reviews, and transform them directly into interactive user interfaces that communicate with live data. This may all sound like the Nirvana of software development, and in many ways it is, but I think of it more as the “next generation”. Instead of figuring out “how” to develop your product, you can spend more time deciding “what” you would like your product to do. You won’t need to redesign your desktop application for mobile devices because now you can support both simultaneously. You won’t need to struggle through upgrading thousands of customers in the field; instead you can deploy changes instantly. There certainly still are hurdles to overcome, but by undertaking custom medical web application development, you can leverage the web in order to move the discussion away from the technological roadblocks to the features that your users want. 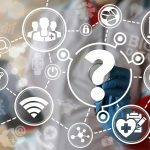 Even though HIPAA stipulates minimum security requirements for electronic protected health information (ePHI), today’s leading security experts continue to announce new and updated recommendations. This steady onslaught of headline can be discouraging: New vulnerabilities discovered! Large corporation hacked! Have you been the victim of a data breach? It’s easy to imagine clandestine groups of genius hackers toiling away to breach a seemingly impenetrable wall of security, but a data breach can be caused by simple human error such as a misplaced laptop or a sticky note with a password written on it. Managing web security is more like maintaining a tolled highway than building an impenetrable wall. Your goal is to make sure that only paying drivers are getting on and off. Both your data storage servers and your user’s web browsers have on and off ramps that need to be monitored, and every component in between, such as web servers and EMR systems are like new interchanges that have to be maintained. The good news is that all of the tools we need to confidently secure these access points for years or decades to come are available today. The trick is to be aware of all of these on/off ramps and make sure they’re covered with the appropriate amount of security. Simple measures like idle timeouts and code obfuscation provide early deterrents. More advanced solutions like two-factor authentication and asymmetric encryption ensure scientifically guaranteed protection. The important thing to remember is that you’re in control of your web application’s security and with the right guidance you can know with confidence that your patient’s data is safe. As more of the applications we use every day move to the web, it’s important to consider how medical software can take advantage of these opportunities. 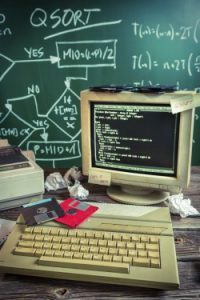 If you look past the growing pains on the early web and with clear eyes at today’s web technologies, you’ll find that there are excellent tools available, many ways to enhance the user experience, and more than adequate security features we can utilize to move medical applications to the next level. And if that’s one level beyond you competition, so much the better!